For a long time I thought I was going to be discovered and become someone really famous (like, really, really famous), most preferably for my vocal talents (insert air quotes all over this thing). I had brief flares of brilliance onstage in two starring roles in two local community theater productions that did not require tune-carrying, and I auditioned for more fairly regularly. On the way to just such an audition for a local production of “Oliver,” that required a melodious solo as part of the audition, I was perusing my piano book for the perfect song. After breezing through several titles I announced to my dad, who was acting as chauffeur, that I would sing “Away In A Manger,” because surely regaling the Lord Baby Jesus with sweet sonnets in August would wield a speaking role, I must have thought in my pious heart. Bemused, my father asked me if I could the sing high notes the song required (trick question because I couldn’t sing the low or mid-range notes either, Dad.). “I can sing them,” I announced without trepidation. “Just not as good as I can do other stuff.” He assured me that in that case, not being able to sing them well meant not being able to sing them at all. Undeterred I trekked into my audition and wailed my way through the beloved carol and stumbled my way through some prescribed clunky choreography, and I did not get so much as a second glance (most likely so that the directors wouldn’t laugh in the face of a fragile, heavily fringed, glasses-wearing 5th grader), much less a call back. Thankfully the “other stuff that I could do good,” included making cookies. 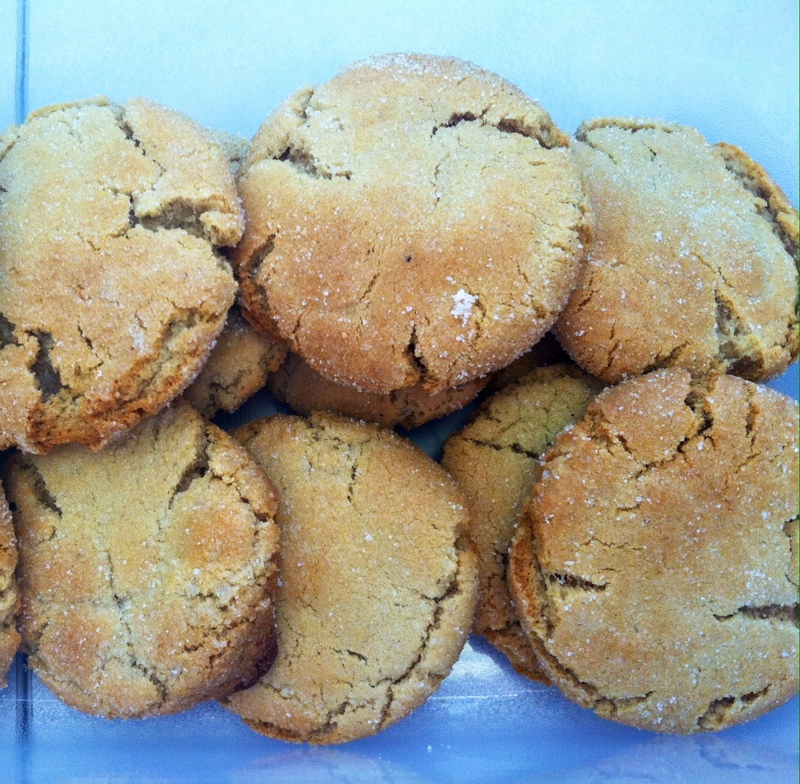 And in the spirit of the holidays, take yourself away in a manger of your choosing with these hybrid gingersnap-snickerdoodle jollies. Mix Crisco, 3/4 c. of sugar and 1/4 c. brown sugar until combined and crumbly. Add egg, vanilla and honey (spritz your tablespoon with some non-stick spray before adding the honey for easy measuring and adding), stir until smooth. Add flour, baking soda, salt and spices and mix thoroughly. Cover bowl and allow dough to chill in freezer for 45 minutes. Heat oven to 350. Roll generously sized balls of dough in extra sugar and arrange on a baking sheet. Bake 12-13 minutes. Remove cookies from oven, and lightly pat with the back of a spatula to flatten slightly while still warm.